There won't be many blog posts lately due to the winter in the northern hemisphere not being a peak season and the fact that I haven't got any ideas for blog posts on a weekly basis, so the posts will be rather limited in the cold season. Today I wanted to talk about a well known spot in North America that most sandboarders (and certainly Mr. Tenge himself) will know about. Now I will be honest, I don't live in North America so I won't know all of the features but I will give you a simplified and medium summary on this wonderful place! 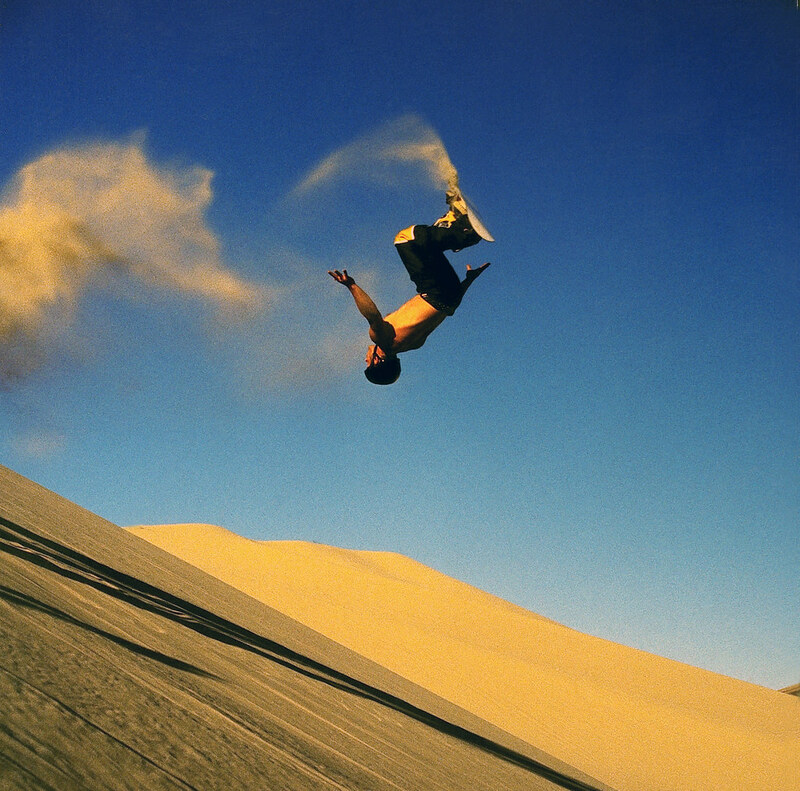 As this picture depicts sandboarding expert and well-known name; Josh Tenge performs a backflip in Sand Master Park, Oregon. Located in Florence and not a short drive from the city name that contradicts itself: 'Dunes City'. The complex is surrounded by 200 acres of public and 40 acres of private dunes for riders to use. The park is open 7 days a week from 1st June to 1st October and 6 days a week (closed Wednesday) from 1st October to 1st June. There is a shop which presumably sells protection, kit, sandboard maintenence goods (wax, paraffin, thinner, paint, etc...) and that's closed from January 10th till March 1st every year. Luckily, this place does have a range of Beginner, Intermediate and Expert/Advanced slopes, this does have rails which gives it a huge advantage but a common but sad truth is this place does not have a lift; yet again not many places do. I have not been on a trip to Oregon or even in the USA but however most sandboarders will be able to tell you that Sand Master Park is one of the most notable sites in the world for families as well as lone or group adventurers. In fact, according to Tripadvisor UK in July 2015; Sand Master Park was ranked #1 best thing to do in Florence, Oregon and 10th out of 305th in the whole Oregon Coast and has received the Tripadvisor 'Certificate of Excellence'. You're probably wondering why I've took so long to post, well the last paragraph was done during July 2015 and this post started in February 2015 at some point? That's how far I've been behind on this blog. I knew it wasn't forgotten but I'm not gonna switch to blogging. I have been adding little excerpts on this blog ever since this post was first written but that's all I've managed due to the impending burden of a second year at college and now I've got a nice steady job so time is extremely uncommon and truth be told, I haven't been putting much time into this as I should have been; I will most probably turn this blog into a monthly/fortnightly rather than a weekly. What a long week this was! Next post WILL be up on the 8th August.